This beautifully simple Scandinavian dish is an elegant accompaniment to a piece of freshly grilled or cold poached salmon. The cooling cucumber adds color as well as crunch. 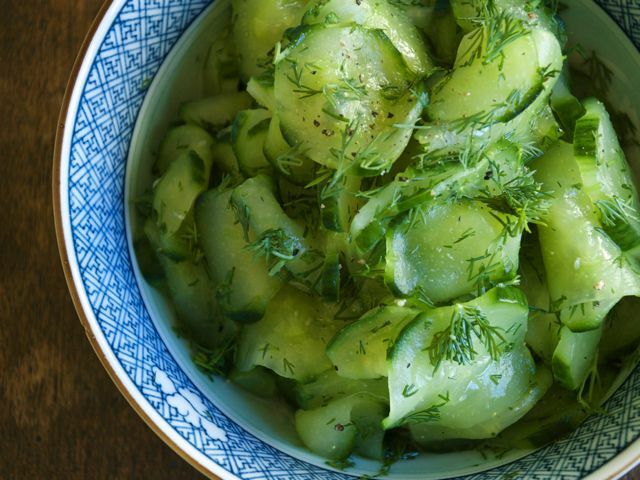 Put the sliced cucumber into a colander and toss in the sea salt. Place a slightly smaller bowl on top of the cucumber and weigh down with weights, or a few unopened cans of food. Leave over the sink for 1 hour to allow the cucumber to drain off excess water. Remove the weighted bowl, wrap the cucumbers carefully in a clean towel, and squeeze out the excess water. Transfer to a bowl, cover, and refrigerate for at least 1 hour, until completely chilled. Meanwhile, put 2 tablespoons of boiling water into a heatproof bowl and stir in the sugar to dissolve. Then add the vinegar, a generous grinding of pepper, and the dill, and place the bowl in the fridge to cool. Once the dressing and cucumber are thoroughly chilled, mix the two together. Adjust the seasoning to taste before serving. If using rice-wine vinegar, add the lemon juice.